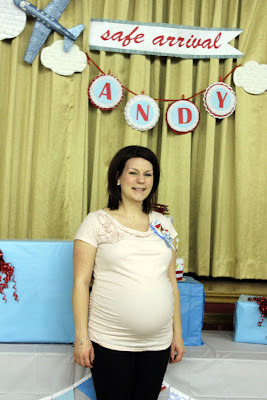 My sister is expecting her first baby -- a little boy they are going to call Andy. I can't believe my little sister is going to have her own baby in about a week in a half. She has been SUCH an awesome aunt to my girls for over ten years, so I'm thrilled she is going to have a little one of her own. We have been so fortunate to have her as part of our lives as our girls have grown up, and I know little Andy is one lucky boy to have such a great mom. Just wanted to share some photos from my sister's baby shower. Her MIL hosted it for her in their church basement -- their family is huge! 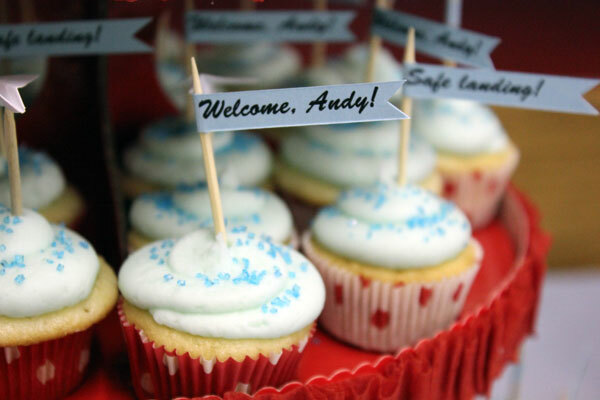 My mom and I made the decorations and desserts, I made the favours, and my mom made some awesome tasty lunch. It was a crazy amount of work for a baby shower, but my sister loved it, and I think she had a great time. 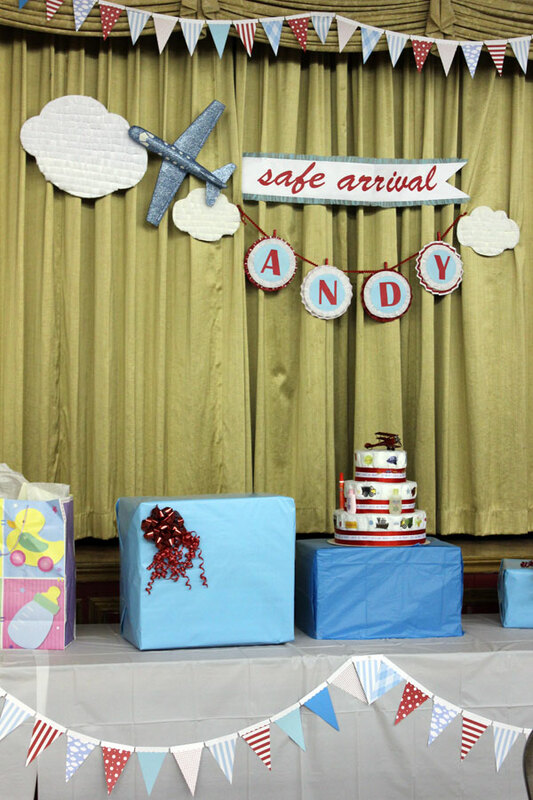 She has decorated the baby's room in a vintage air plane theme, so we used the same idea for the baby shower, though it ended up much less vintage and brighter and more modern with lots of red and aqua, and a bit of glitter and many paper air planes. Here is part of the hall. My mom made about 40 of those tissue paper pom-poms, and I think we could have had another 40 to hang! We decorated the stage with a glittery flying plane, crepe paper clouds, and a banner to wish Andy safe landing. I hand cut the letters for the banner and his name, and made big layered paper fans to go behind his name. I wish I had better photos of the name rosettes because I was so thrilled with the way they turned out. The crepe paper layer behind the cardstock rounds added such a nice bit of fullness without being overly girly or frilly. I hung the paper fans behind the letters on clothes pins I painted red and then glittered. While preparing the shower I woke up one morning and knew I just had to glitter up that big airplane. My sister's MIL made the diaper cake and she was so proud of it -- she swears she is not a crafty person, and this was the first diaper cake she made. 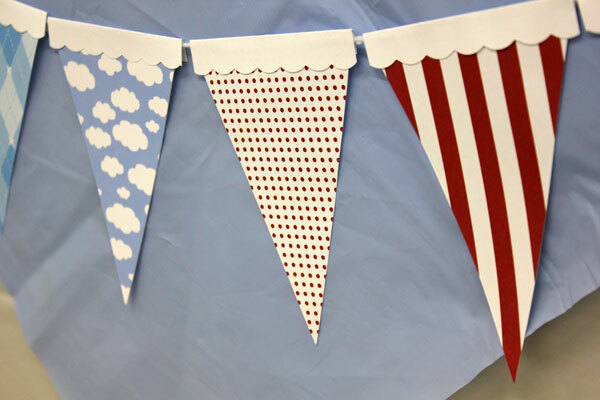 I made almost 80 feet of this paper flag banner to hang around the gift tables, above the stage, around the dessert and food tables, etc. 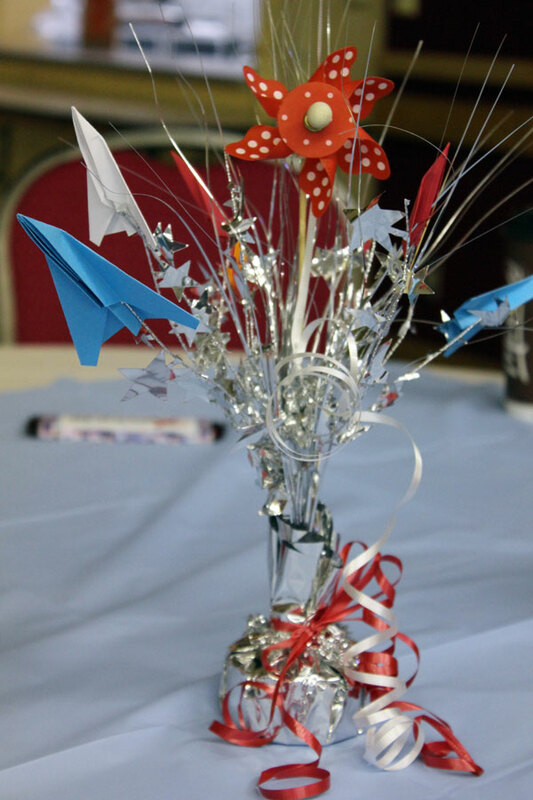 The centrepieces were simple, but I liked them... just folded paper air planes on these silver balloon weights. 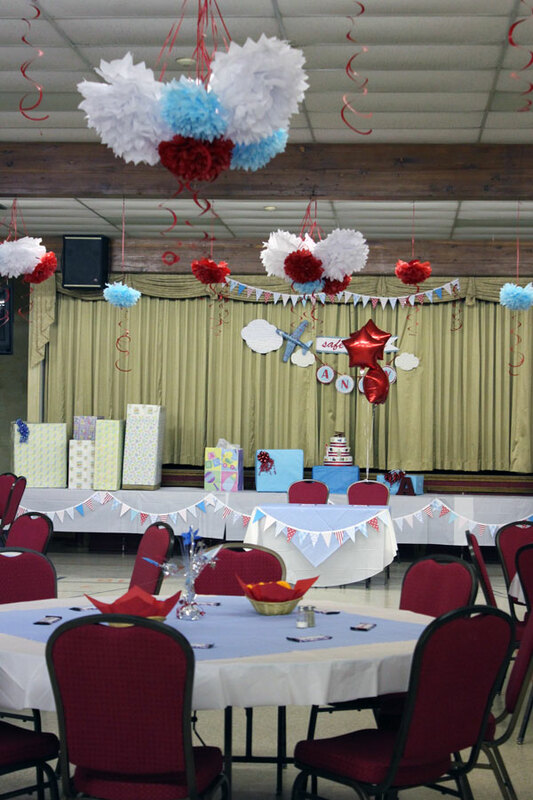 There was a red star helium balloon on each table. My mom found these little pin wheels at Hobby Lobby and they were the perfect finishing touch. 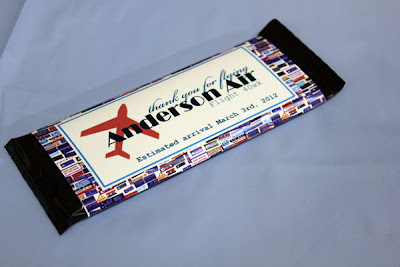 My sister's MIL wanted to give chocolate bars as the party favour, so I designed this wrapper and wrapped them all. 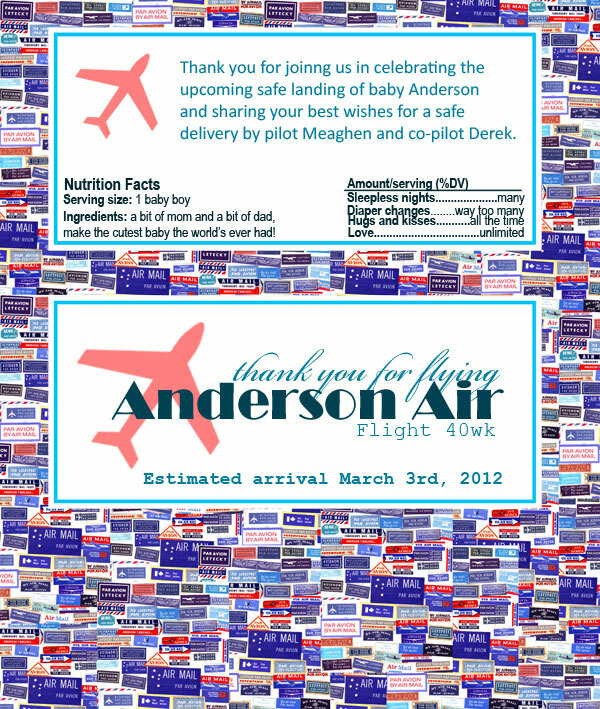 Baby Andy`s full name is Anderson, and I tried to combine the air plane theme and thank you on the front of the wrapper. 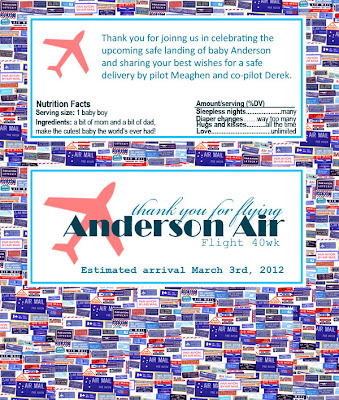 The backside of the wrapper had a thank you note, and cute baby-themed nutritional information. Dessert! My mom made brownies, fool's toffee, lemon bars, sugar cookies, and cake. 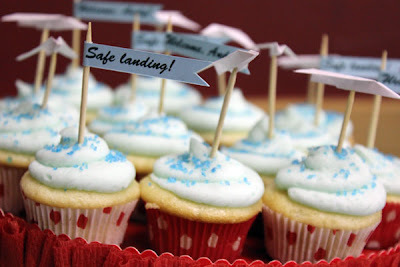 I made cupcakes in red and white dotted liners and iced with blue icing. My DH made white chocolate covered popcorn -- one of Meaghen's favourite desserts. 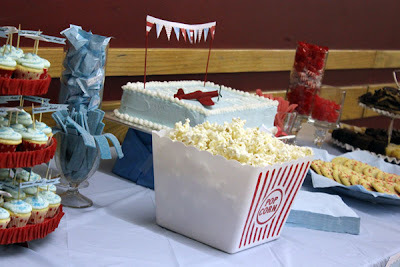 A few jars of coloured candy added to the colourway on the dessert table, and were a big hit with the children guests. I made cupcake toppers of flags and paper air planes. And, finally, a photo of my cute little sister! Hi, the shower looks amazing!!! I am doing a Precious Cargo themed shower. Where did you find the candy bar template if you don't mind sharing? Thanks! Thanks for your interest. I made the template myself. Good luck with your shower, it sounds like a very cute theme!